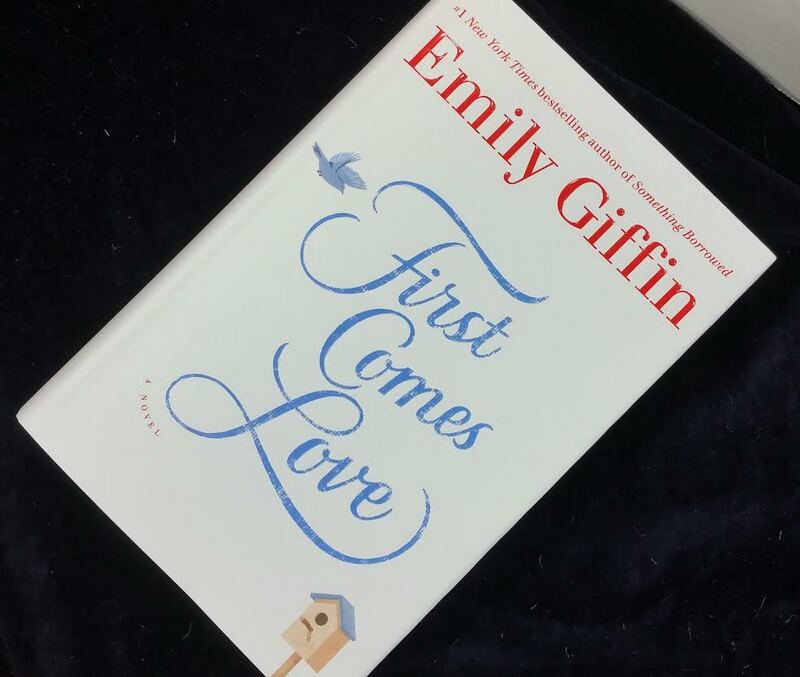 First Comes Love by Emily Giffin- I was first introduced to Emily Giffin by a friend who forced me to read Something Borrowed. I ended up loving it and grabbed the second on the minute it went on sale. Also good! But then I got distracted by the floods of fabulous YA and never really went back to finish this series. I don't know about you but I have a sister who is 18 months younger than me. Between the two of us, I suppose I would be the Josie version and she would be the Meredith. Still, who hasn't wondered what their life would be like if (fill in the blank) hadn't happened. I like Emily Giffin's writing style so I'm pretty sure I'll enjoy this. Carpo Coffee Tossa Terroir Roast- Every box has a coffee, tea or chocolate and this month it's coffee. This is a whole bean version from Brazil. It has a rich, full boxy with hints of lemon, cherry and dark chocolate. Personally, coffee always tastes like coffee but I do prefer it freshly roasted and this was just bagged up last week! I'm taking it camping with us. 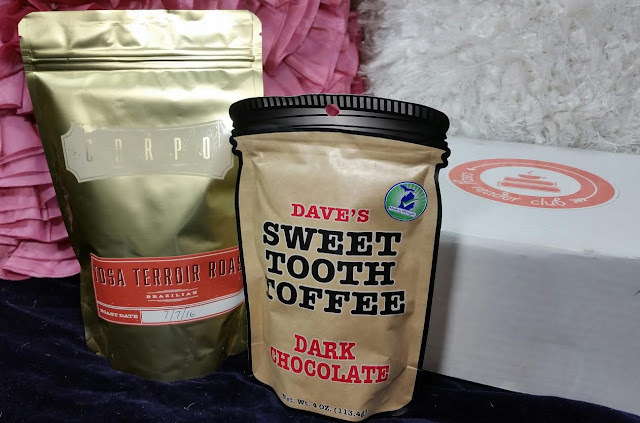 Dave's Sweet Tooth Dark Chocolate Toffee- I'm so happy it's DARK chocolate!! I have had this brand before and it's excellent but I got it in milk. This is dark so it's going to be even better! You have to be careful with this stuff because once you start, it's reallllly hard to stop eating it. Miss Mac Handmade Tote Bag- This, my friends, is absolutely adorable. It is probably one of the cutest totes I've ever received in any subscription box ever. And I've gotten a lot of totes. This is reversible. One side is gold sparkle burlap and the other (obviously) is starfish. I love it. LOVE it! 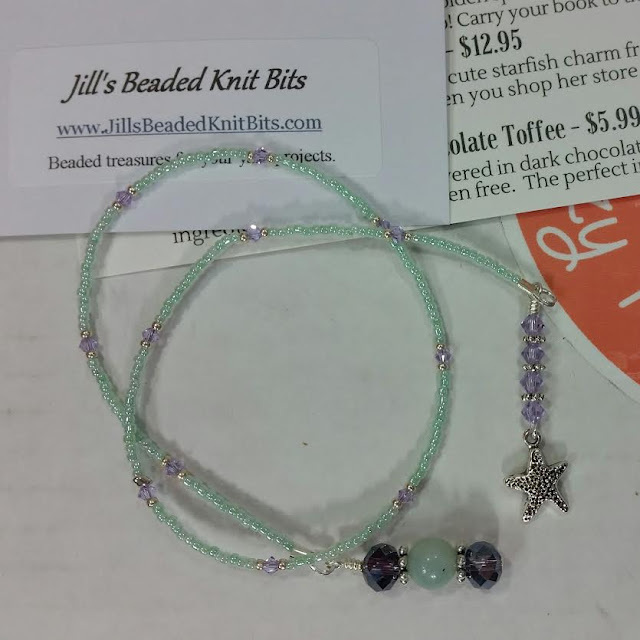 Jills Handmade Stuff Bookmark- You can't really get away from bookmarks in book boxes. I'm ashamed to say that I'm a professional at dogging ears. I can't get away from it no matter how hard I try. This, however, is so pretty I may force myself to use it. Otherwise I'm going to incorporate it into the next piece of sewing work I do. VERDICT: I am really happy with the contents of this month's box! 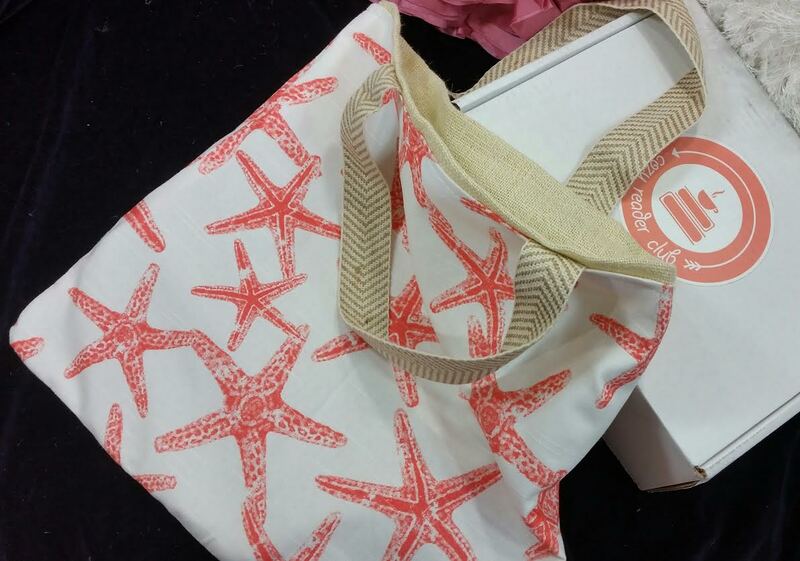 That tote just does it for me! Book boxes rarely dazzle me with their value but it's nice to see Cozy Reader Club being worth a little over the price plus shipping even with the book counted at the Amazon price. This box is not cheap, it's definitely a luxury. If your life revolves around books and the experience of reading them, you'll understand completely why I love it so much in spite of that. The book choices have been varied and excellent as well. 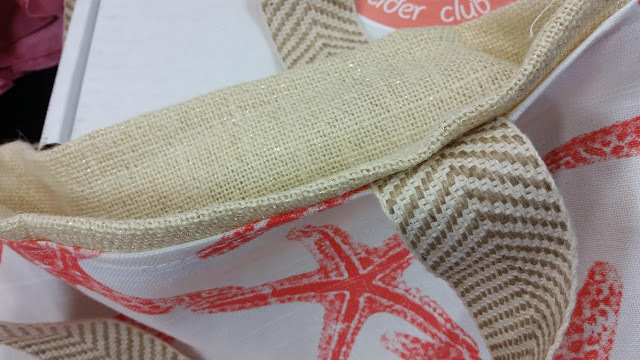 If you'd like to sign up for Cozy Reader Club, you can do that here. Once you're on the website, you'll likely get a popup where you can enter your email address to receive a $5 coupon. Grab the opportunity! 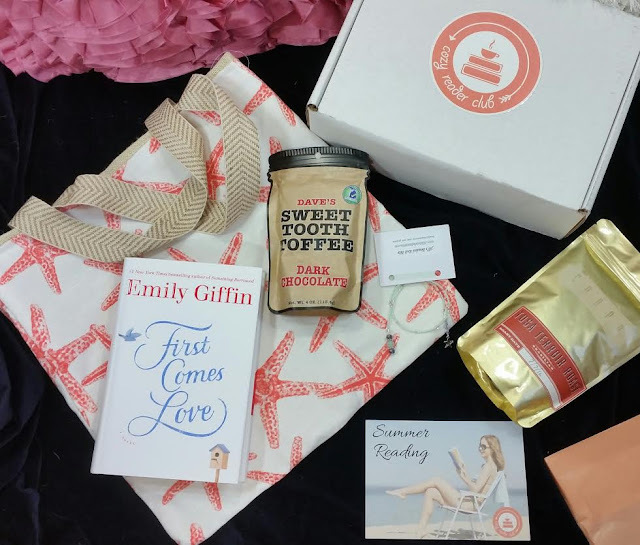 Or use code COZYTIME for $5 off your first box. What are your favorite book boxes? What would you love to see in one?